For the past few weeks I’ve been super busy. Not in the fun, making lots of tutorials busy but in the carting a sick cat around to multiple vets (seriously, 3 in as few weeks) kind of a way. My kitty Marla went to have an ultrasound a little over an hour’s drive away from home and the vet she saw said that she needed to have her kidney removed. Unfortunately for all of us he has his own surgery going down and was unable to do the removal. But another vet another hour away could do the surgery and Miss was scheduled to have a kidney removed earlier this week. Fab, right? But then the new vet had his own emergency and we have been rescheduled for next week. And until she gets this surgery, which will make her feel so much better, I’ve got to go to certain lengths to make sure she’s taken care of. I’ve been given a hard time about how ridiculous all of this has been but I don’t believe in “just a” anything when it’s something (or someone) who matters very much to you. Marla isn’t “just a cat”, she’s my little fuzzy baby and I’ll crawl around on that floor 5 times a day every day until I can get her fixed :) Unfortunately, and finally to the point for this project, for me it means my body is achy and awful because I’m not built for crawling around and jamming myself underneath Hollywood bed frames. 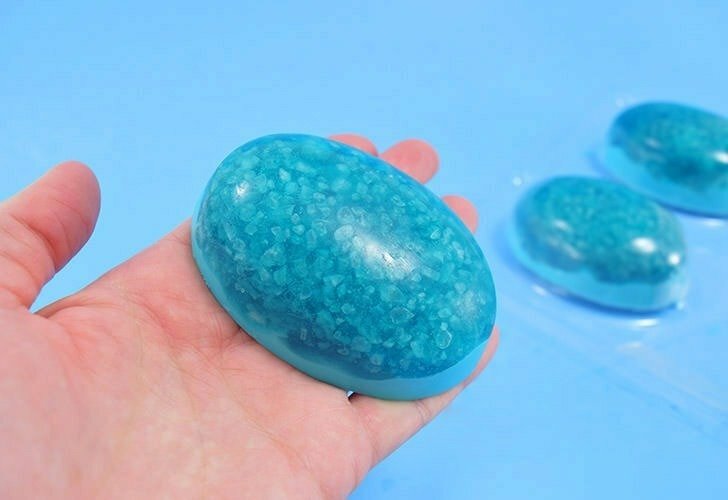 And since I simply do not have the time for a nice soak in the tub, I decided to make a soothing Epsom salt soap bar so that I can get some relief even with a quickie shower. 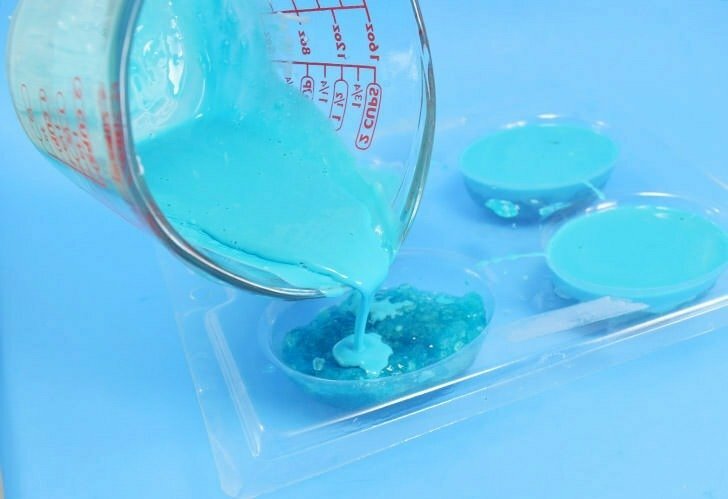 Melt your melt a clear soap base according to package directions and add soap colorant and scented oil. I added teal colorant and a lovely, beachy Ocean Breeze scented oil. To save some cha-ching on oils allow the base to cool. The hotter the melted soap is the more of the scent that will burn off. Okay, so I totally used the WRONG SALT for this project because in my haste while making the tutorial I grabbed the wrong bag. Womp, womp. But with the power of Photoshop can pretend like I got it right! Hahaha! :) Now, if you don’t get the right stuff it will still work, as in it will make soap bars that are super pretty, it just won’t do a darn bit of good for sore muscles AND the salt sort of dissolves as you make contact with it so it doesn’t exfoliate, either, so in the case of the wrong salt it’s for looks only. Now you’re going to add a LOT of salt to the bars. 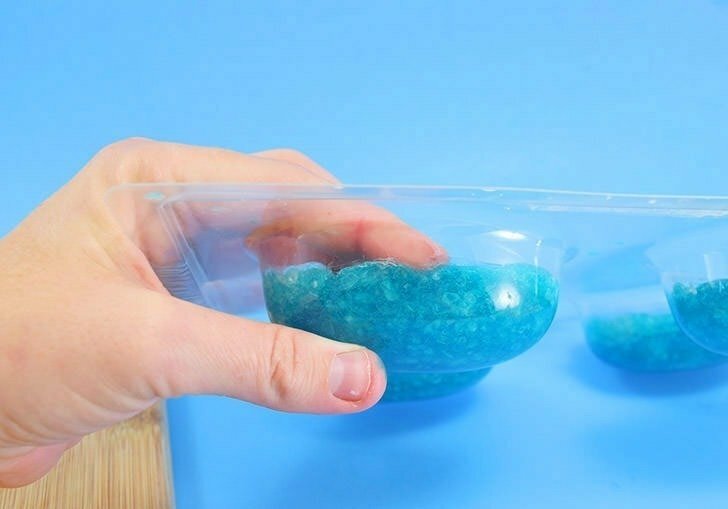 You want your liquid base to be super slushy with the stuff but you need enough liquid soap that it can still move around freely when you stir. It’s so seriously like a Slush Puppy consistency. Remember those? Should you get too much salt in the mix and you find you’re having a hard time you can always add more soap base and toss the whole business in the microwave. 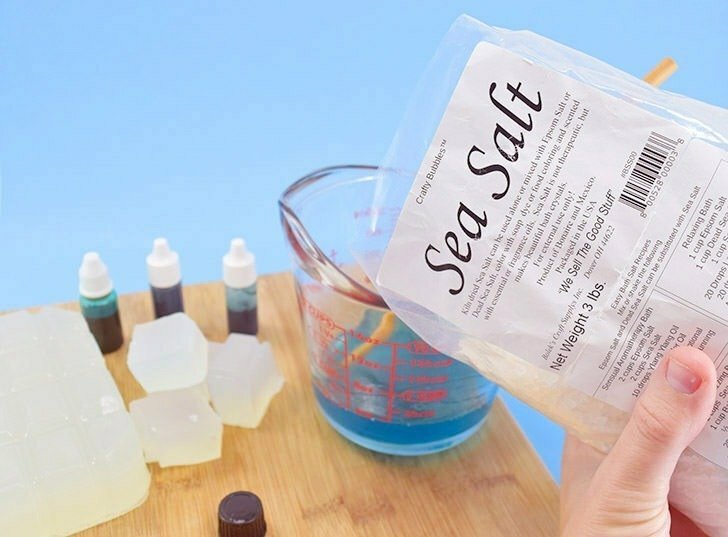 You’re going to lose some of your salt crystals this way, but it will work better in the end. 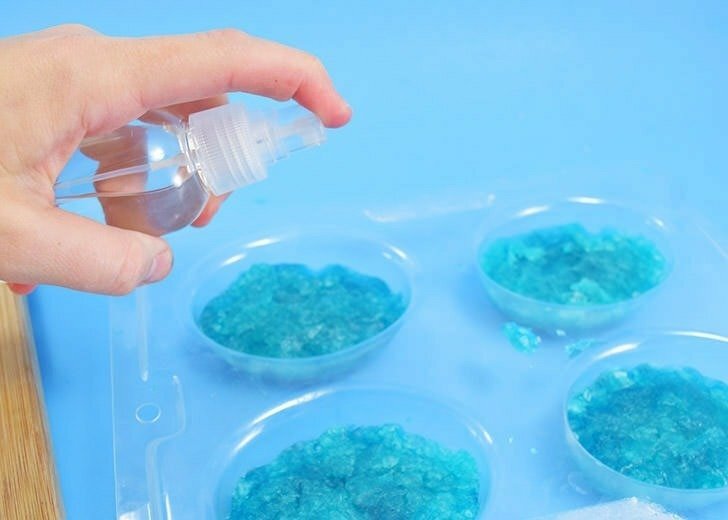 While still liquid pour the salty soap into the bottom of your molds and allow a good 10 minutes at room temperature to begin setting up. 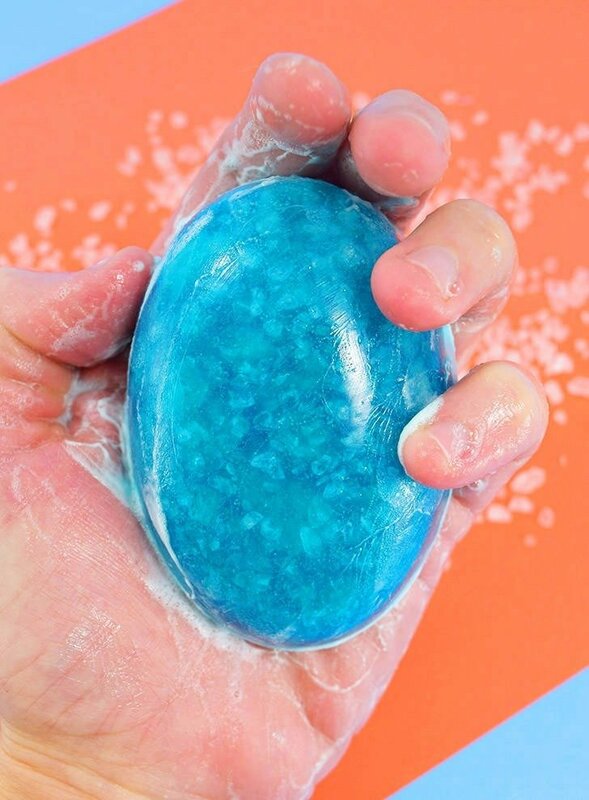 Once the soap is no longer super hot, but while still malleable, push the salt mixture to pack it into the mold as tightly as you can. For a fun, almost natural stone-like look, go around and push the edges at different depths for a jagged edge. Melt, color and add fragrance a soap with a white/opaque base. 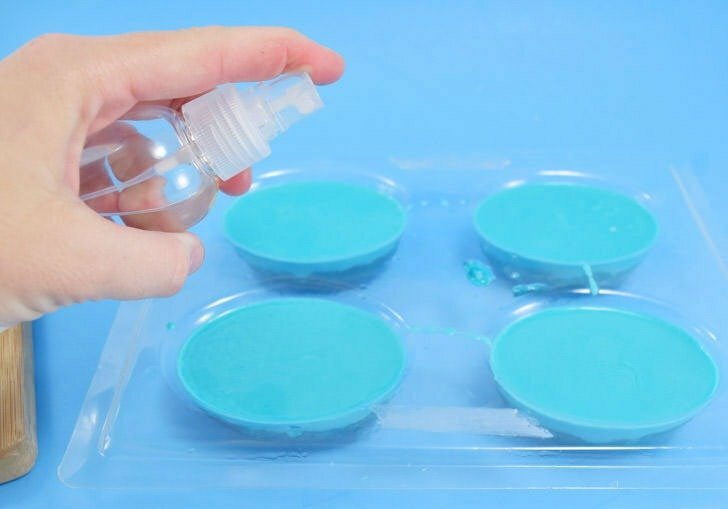 Liberally spray rubbing alcohol onto the soaps inside of the mold. This step is required for adhesion of the 2 layers. To keep things cheap, I refill a travel spray bottle I got at Walmart with 91% Isopropyl Alcohol I purchase there, too. 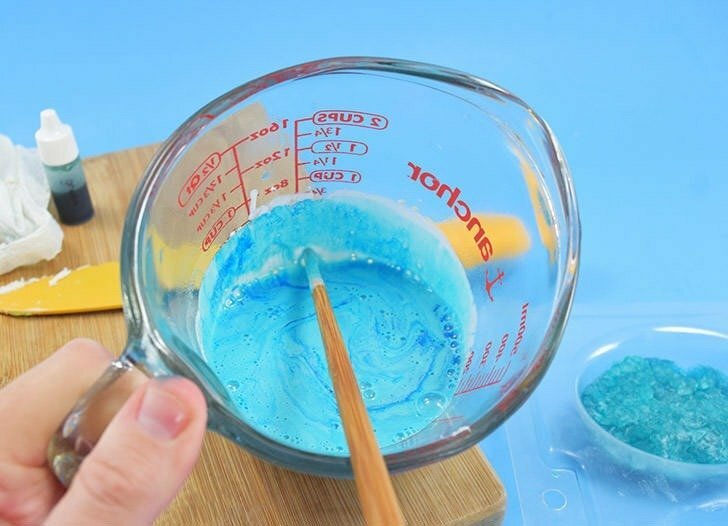 Pour your melted base onto the salty soaps and get to a surface that is nice and flat to begin cooling. Hit that milky opaque layer of soap with a quick mist of alcohol to pop any little bubbles and produce a nice, smooth backside of the bar once un-molded. Allow the soap to set up at room temperature until mostly firm and then transfer to the fridge to quickly finish up. Pop the soaps out of the molds to finish this project up. 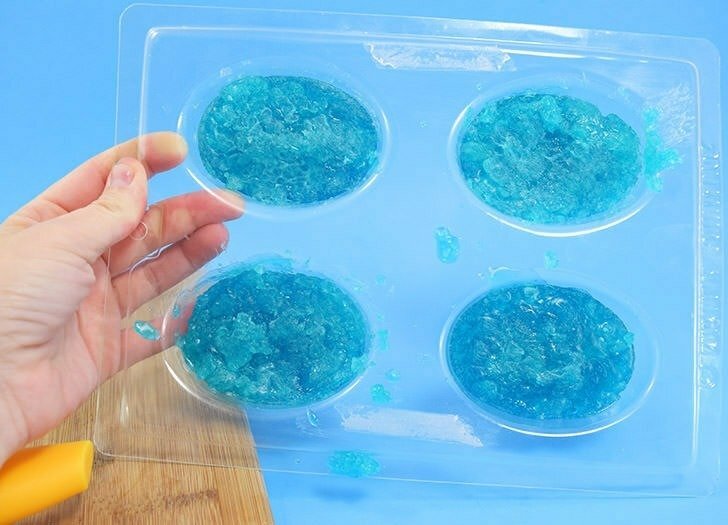 If you’re using clear molds, like me, and are having a difficult time with anything popping anywhere at all, toss your soap in the freezer FOR NO MORE THAN 15 MINUTES (because much longer and your soap will sweat and sweat and sweat) and then smack that business on a table. Through the front of the mold, there will be cloudy, white-ish areas that start to appear. This is where there is air between the soap and the mold. Push on these spots to pop that business out super easily. I hope Marla is up and running around again. Enjoyed the recipe and will probably try it. Val—Such a great idea to use a muscle ache/muscle relief blend of essential oils as the fragrance. I just tried this and my epsom salt clumped up and got gross. Any ideas? I was so bummed because they didn’t look at all like pretty crystals. 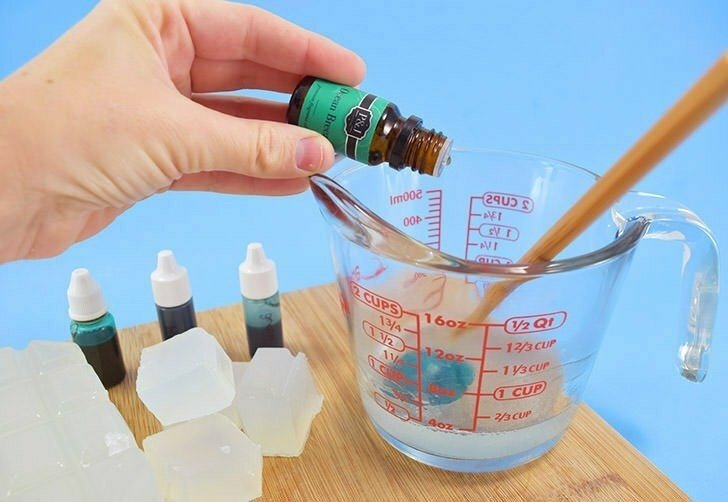 I tried this recipe also and when i added my salts to the melted soap base it like all dissolved and got really thick and clumpy. I put it back in the microwave to liquify it again and it looked nothing like yours. I will keep on trying lol. What a great idea. Will definitly give this a try. I hope your 🐱 fur baby is doing better. Don’t listen to those who give you a hard time about her. 😊 We have a 16 year old 🐶 mixed beagle that would do anything and everything for. Thanks for the soap recipe! Hi. 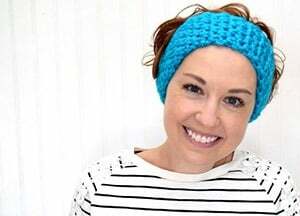 Love the idea. 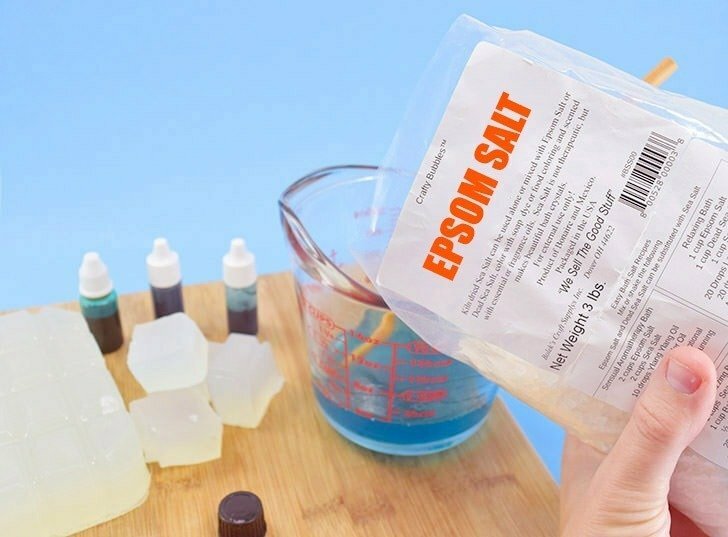 Can I use magnesium flakes instead of epsom salt? I haven’t tried magnesium flakes but I think it should work. Let us know if you give it a try?